An issue over the lease of the property, which was damaged in two arson attacks in the last three months, is the reason not to proceed. In a statement, the department said it regretted the decision but it was taken after legal advice from the Chief State Solicitor's Office. "[It] found difficulties with the lease agreement between the owners of the hotel, and the operator renting it, which made proceeding with the proposed centre unviable," the department said. The department said it is committed to sourcing suitable accommodation for asylum seekers and a "regional procurement process" is under way. The Minister of State with responsibility for equality and immigration, David Stanton said today that the Department of Justice became aware of issues with the lease last December. Speaking on RTÉ's Drivetime, Minister Stanton said the Department had hoped the issue could be sorted out, but it was not possible to do so. "What we didn't want to do was have people in the centre and then in a few weeks time have to move them out," he said. When asked if the decision not to proceed had anything to do with arson attacks at the property, Mr Stanton said the incidents were 'unfortunate' but were not the reason for the announcement. 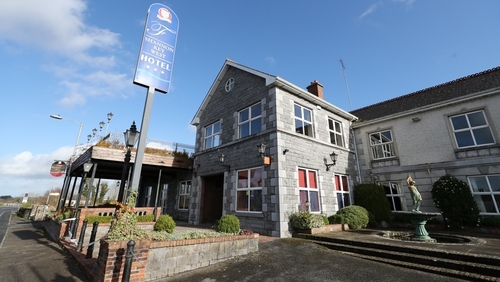 However, local Fianna Fáil TD Eugene Murphy said the situation over the use of the hotel to accommodate asylum seekers was "very badly handled" by the Government. The Roscommon Galway deputy told RTÉ's Drivetime that there was a "veil of secrecy" around the plan to house people in Rooskey. He also said that local residents were annoyed by "outside groups" from the "extreme left and extreme right causing extreme interference" in the town. Leah Doherty of the Leitrim and Roscommon United Against Racism Group said the Government was pitting vulnerable communities against asylum seekers. Speaking on RTÉ's Drivetime, she said the the lack of consultation by the Government over plans to house asylum seekers in Co Leitrim hotel "is fueling racism". She said in order to avoid a similar situation happening again the Government needed to take action by scrapping Direct Provision and housing people in communities instead. Meanwhile, Fianna Fáil's spokesperson on equality, immigration and integration Fiona O'Loughlin said the decision sent the message to the perpetrators of the two arson attacks at the premises in recent months that they have gotten their way. "This decision, very ironically announced on the International Day for Elimination of Racial Discrimination, is very concerning and I do tend to think it sends absolutely the wrong message," she said. Speaking on RTÉ's News at One, Ms O'Loughlin said the attacks were not reflective of the hospitable nature of the people of the area, but they did happen. However, the Kildare South TD also said she believes the Government must consult local communities more when planning such centres.